There have been two fatalities this last week regarding young children becoming trapped in electrically operated gates. Accidents and tragedies can happen anytime and anywhere but we can all do our best to make our children's environment safer. Never put your baby's cot next to a radiator - it may get too hot. Never place your baby's cot next to cutains and curtain cords. They could grab the cords and strangle themselves. Never overload an active baby's cot with toys. They could use them as a "step" to help them climb out of their cot. Always use a good quality and most importantly a correctly fitting mattress. We have a huge range of mattresses for prams, cribs, cradles and moses baskets. We also make travel cot mattresses, cot mattresses and cot bed mattresses. We also have a bespoke mattress service. Cut smoking in pregnancy fathers too! And don let anyone smoke in the same room as your baby. Do not let your baby get too hot, and keep your baby head uncovered. It especially dangerous for your baby to sleep in your bed if you (or your partner): are a smoker, even if you never smoke in bed or at home, have been drinking alcohol, take medication or drugs that make you drowsy, feel very tired; or if your baby: was born before 37 weeks, weighed less than 2.5kg or 5½ lbs at birth, is less than three months old. 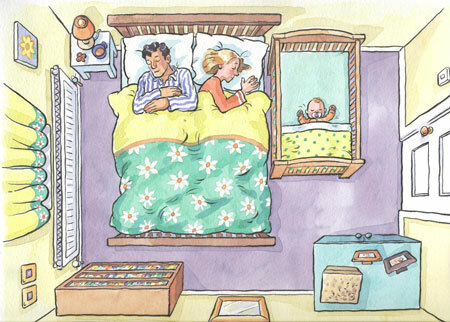 Dont forget, accidents can happen: you might roll over in your sleep and suffocate your baby; or your baby could get caught between the wall and the bed, or could roll out of an adult bed and be injured.